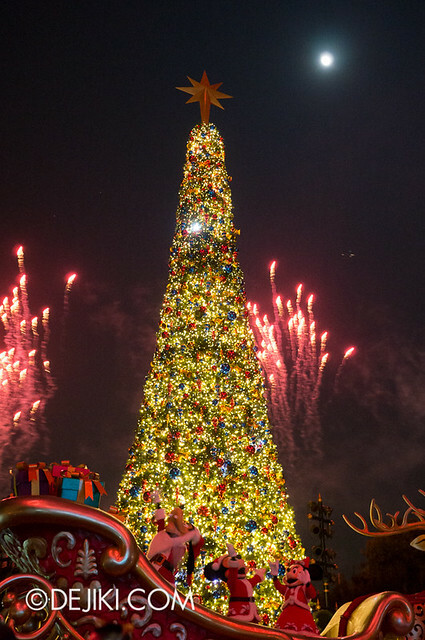 Christmas Illumination is a show performed at Main Street, U.S.A. every night during Disney’s Sparkling Christmas season. 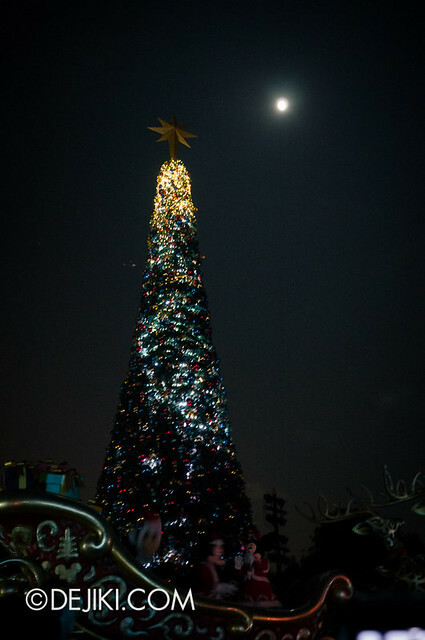 Even without the illumination ceremony, the tree is quite eye-catching. The baubles bounce light from Main Street. 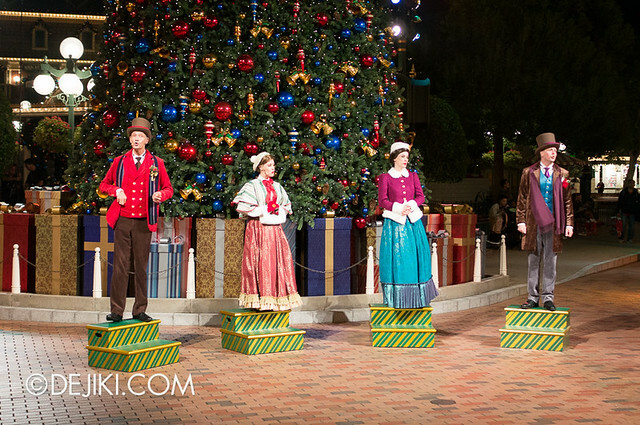 A quartet of Christmas Carolers sets the festive mood at Main Street with a series of carols. 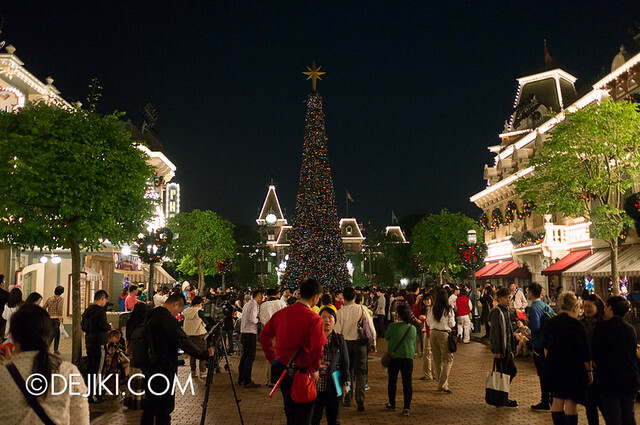 As movement around the Christmas Tree at Main Street will be restricted, it will get very packed during the Illumination show. 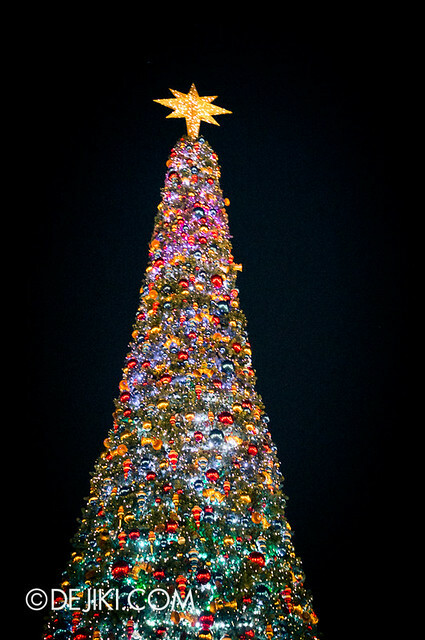 The Times Guide state that Christmas Illumination starts at 6:45PM*, but best to be there at least 15-20 minutes before for a good viewing spot! *Show time varies. 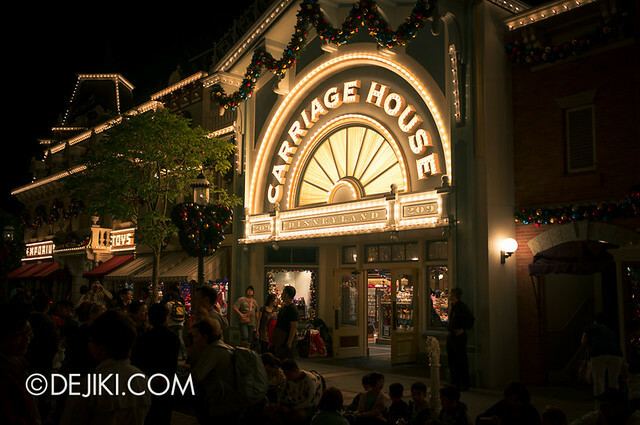 Check the Times Guide or with a Cast Member on day of visit. Soon the entire street is filled up… and you start to see small children sitting on their parents. 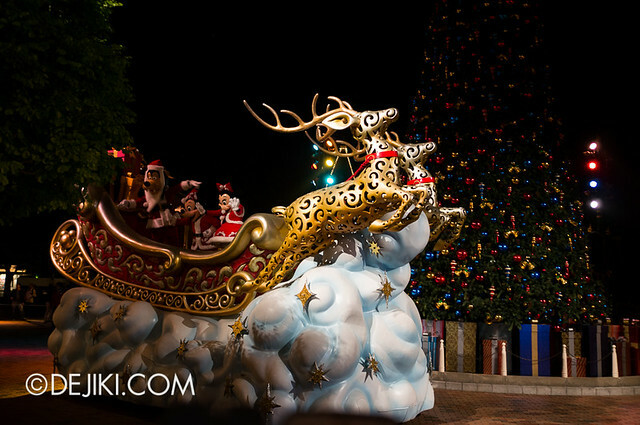 A sleigh with golden reindeers floats into view. 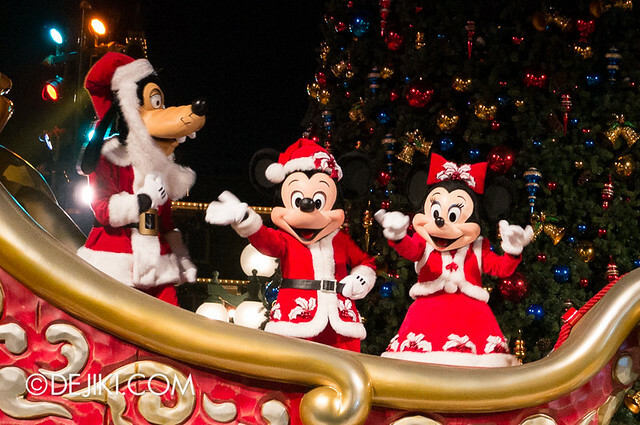 It’s Mickey, Minnie and Goofy – in Christmas outfits! 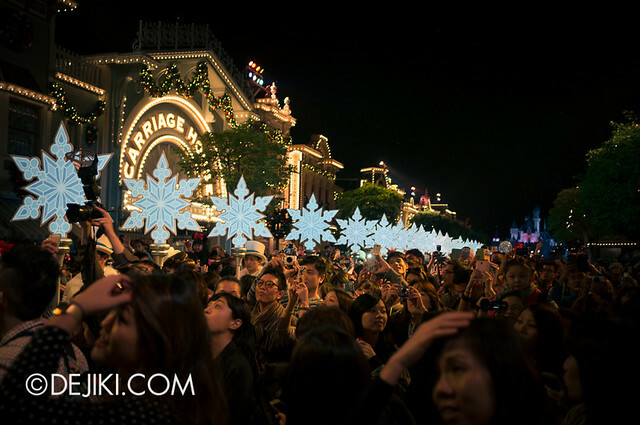 While Mickey and Company make their dramatic entrance, an endless line of dancers holding snowflakes appear along the entire stretch of Main Street. 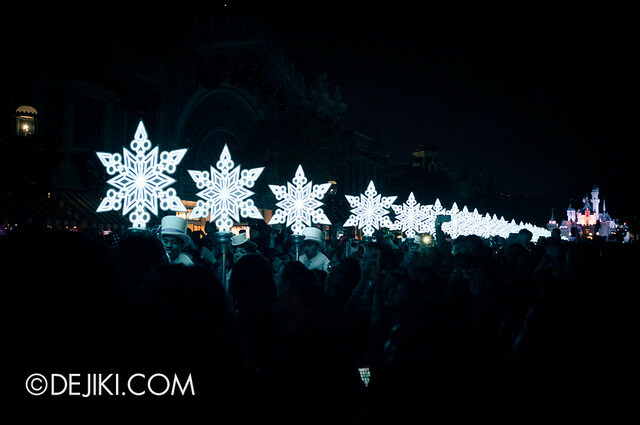 Lights along the road begin to dim – and soon only the cool glow from the giant Snowflakes fill the street. 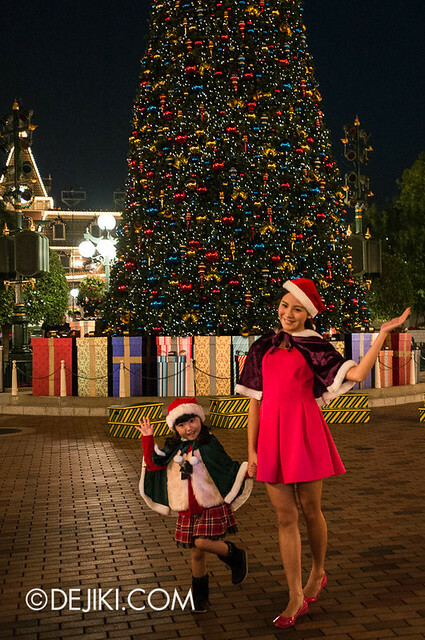 They form a glacial bridge of light from Sleeping Beauty Castle – the heart of Hong Kong Disneyland – to the Tree of Christmas Town. 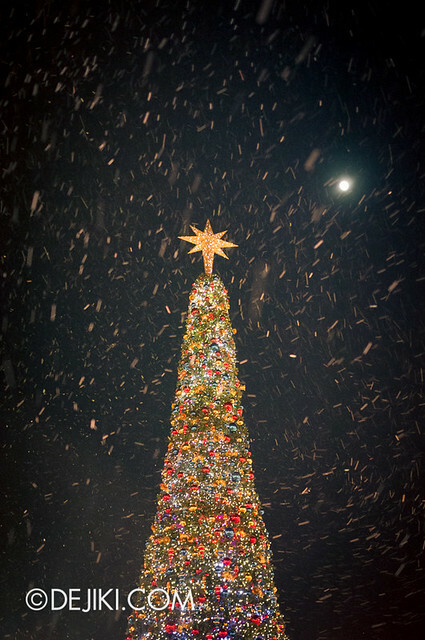 The tree shimmers, as bursts of glitter fireworks race towards the Christmas tree. And finally, the tree is completely lit! More fireworks! The crowd goes “ahhh” over the lights. And soon snow began to fall! 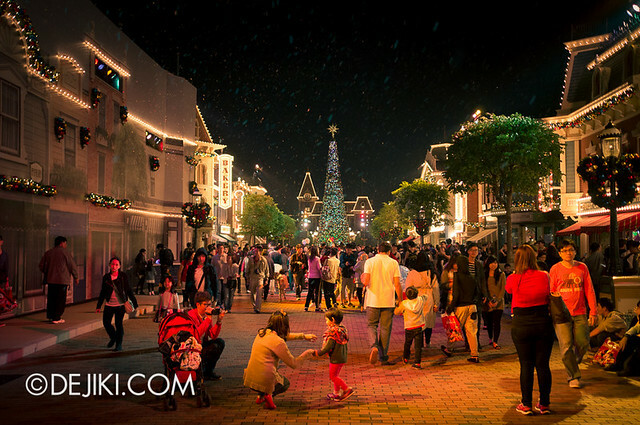 Snowfall is enchanting at Main Street’s Christmas Town. 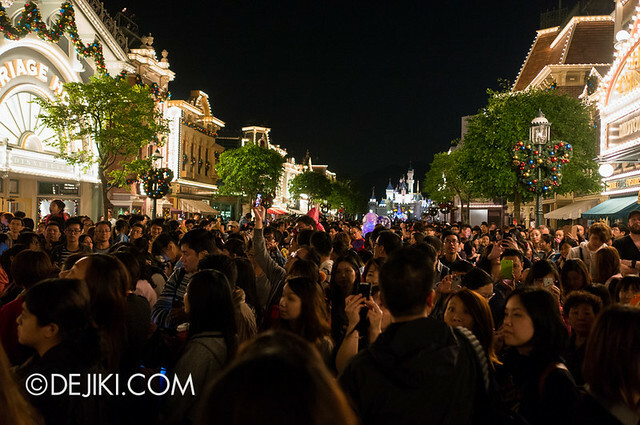 It’s chilly at night in Hong Kong Disneyland. Strong gusts whip the snow into the air. Stay outdoors too long and you will have yourself covered in (artificial) snow. It’s quite a magical moment for everyone. 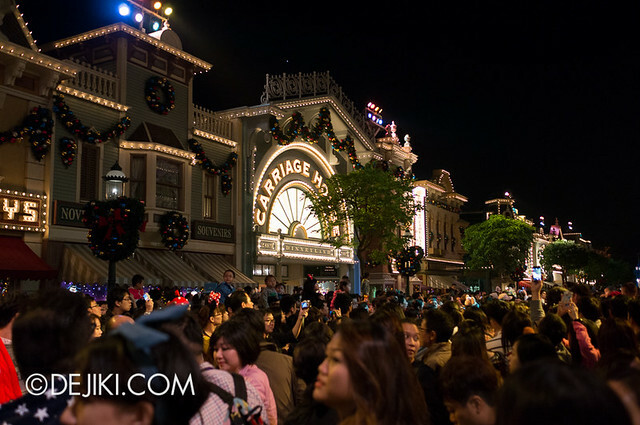 One night, we witnessed a proposal right after Christmas Illumination… and she said yes! 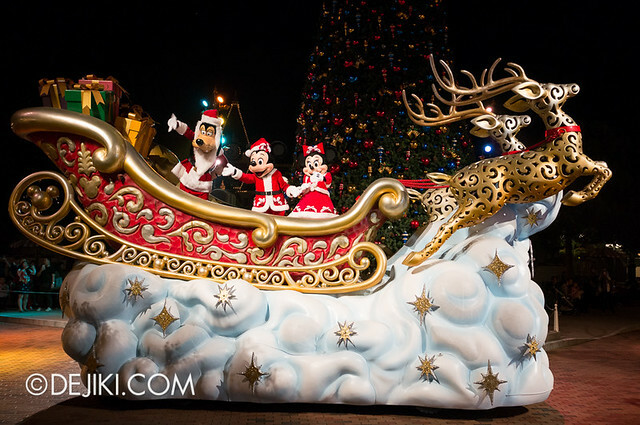 Stay tuned for the next entry in the Sparkling Christmas series as we explore Christmas Town at Main Street, U.S.A! I really like the new Christmas tree. It looks gorgegous during the show. Especially with new led multicolor lighting system.